Today the Stockholm Based Royal Family attended the Polar Music Prize! (If you want to look back at last years outfits, click here for our full recap!) The Polar Music Prize was founded in 1989 by Stig "Stikkan" Anderson- the publisher, manager, and lyricist of ABBA. The award is one of the most prestigious awards in music as it is given to individuals, bands, and institutions and is awarded to a musicians in a variety of genres from around the world. The King has been presenting the award for many years. Previous winners have included Yo-Yo Ma, Led Zeppelin, Joni Mitchell, and Elton John- to name a few. This year the award is being presented to Max Martin and Cecilia Bartoli. Victoria looked stunning in a white gown from Ralph Lauren which she wore an H&M necklace over. This necklace is from the H&M 2014 Conscious Collection. I am surprised that she waited until now to wear it because it is a very "Victoria" piece. With that said, I am very glad she waited because it looks AMAZING with this dress! Her clutch is from By Malene Birger, which she first carried at Sofia and Carl Philip's wedding. 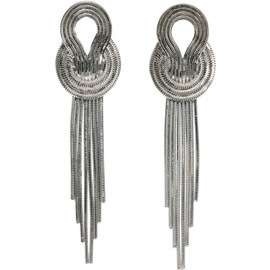 Her earrings are the new Nikola earrings from Caroline Svedbom. She also wore new silver sandals also from H&M and what appears to be a new gem in her hair. She wore her normal cluster of bracelets on her left arm (Kreuger Jewellery, Sophie by Sophie...) Check back later for updates on those if I can manage to find them. This is Princess Sofia's first time attending the Polar Music Prize and she nailed her outfit. The top and skirt (yes- it is separates) come from Rodebjer's AW16 collection (Thank you Johanna). Her shoes are a new pair of pumps from Charlotte Olympia and her earrings are from Lara Bohinc. Sofia may have borrowed the earrings from Victoria, or she may own her own pair- but many of you will recognize them as they are one of Victoria's favorite statement earrings. Her clutch comes from Mango and she first carried it last year at the King's Dinner for Nobel Laureates. I am in love with both of these ladies looks. Queen Silvia's? Not so much... Which look was your favorite? Also check back in a few days for a special guest post!